Phil Mickelson ranks among the top golfers of all-time, but collectors don't have many cards to chase outside of one year. Nevertheless, there are several key options available for Lefty that have produced good interest in the hobby. With 42 PGA Tour wins, Phil Mickelson ranks ninth all-time. He has also amassed five total major champion titles and, most notably, three wins at The Masters. Shop for Phil Mickelson Golf Cards on eBay. 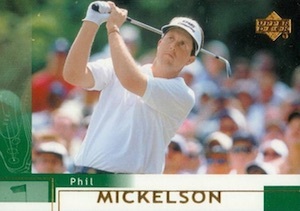 Although he joined the PGA Tour in 1992, collectors had to wait until 2002 for the first licensed Phil Mickelson golf cards. That year brought the official rookie cards for Phil Mickelson and remains the only period of products to find his PGA cards. 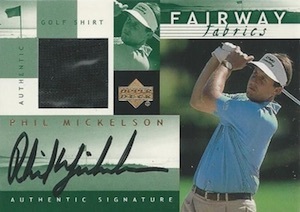 Although there have been several official golf products released by Upper Deck since then, Mickelson has not been featured in any capacity, including base cards. The following guide highlights the top Phil Mickelson golf cards, including all his official rookie cards. Click on the images or listings to shop for cards on eBay. 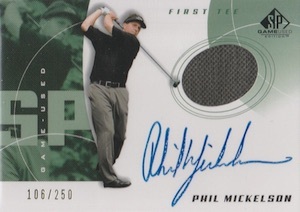 The most plentiful of all the Phil Mickelson autographs, the 2002 SP Authentic rookie card is also the most popular. The on-card signature and higher print makes this one of the most heavily moved cards for Lefty. Additionally, there is a Limited parallel (#/100) and an Extra Limited parallel (#/25) available for the noteworthy golf card. 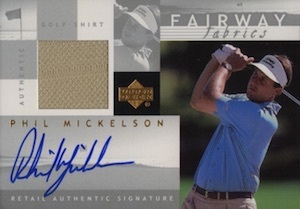 A little more busy than his SP Authentic rookie, Mickelson's 2002 SP Game Used rookie card adds a swatch of event-worn golf shirt from an official tournament. Numbered to 250, these pop up less often but are still a preferred option for collectors. 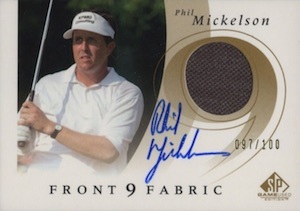 Fundamentally similar to the Phil Mickelson rookie card in 2002 SP Game Used, this Front 9 Fabric insert is a signed parallel to the base relic from the set and limited to just 100 copies. 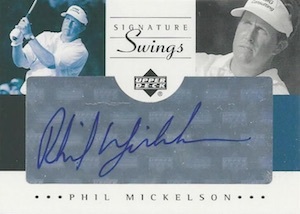 Although it is the only sticker version among the Phil Mickelson Upper Deck autographs, the autographs on the Signature Swings inserts have held up better than some of the hard-signed cards. It also offers one of the largest signatures for Mickelson collectors. Not technically a rookie card as part of a direct factory set from Upper Deck, Collector's Club includes an early Phil Mickelson card that can normally be found for budget prices. 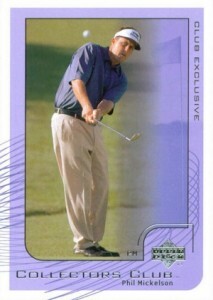 The final official rookie card for Phil Mickelson comes courtesy of 2002 Upper Deck Golf. As the only rookie that is not signed, it generally takes a backseat to the other two rookie cards. However, the large image of Mickelson and horizontal layout give it a bold look. 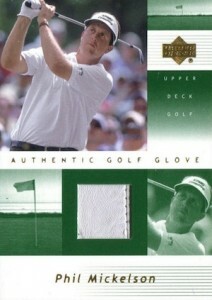 Also found in Upper Deck Gold, the Authentic Golf Glove card for Phil Mickelson is one of the several cards to include a piece of event-worn gear. Obviously featuring a piece of his glove, the image of Mickelson on the card is virtually identical to his UD rookie card above. 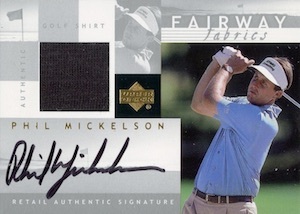 Another signed relic for Phil Mickelson, there are actually a few different autographed versions of the Fairway Fabrics card. The green Authentic Signature card features black ink while the silver Retail Authentic Signature card is available in both blue and black ink and includes khaki and black swatches. SPORTING LIFE GIANT SIZE GOLF 1-of-1 #m5 - Phil Mickelson, Golf Legend!